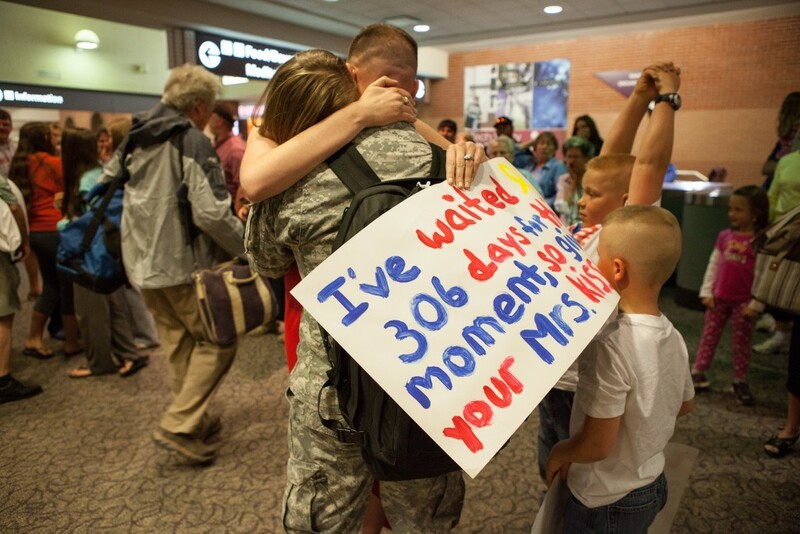 This is Part 2 of the Military Homecomings are a Process; Not an Event blog. Read Part 1 here. Military families sometimes have to make decisions that are unimaginable. We do the best we can to weigh all of the costs and benefits and try to make the best decision for our family and our future, with the limited and often inaccurate information we are given. But no matter how we try to prepare for or justify our choices, at the end of the day, it’s unnatural to have to choose a fate such as a deployment. And that’s if you have a choice at all. When it was just the two of us, I inquired what that was all about. He told me that he wanted to play a voicemail for me. “Derrick, this is Captain. You’ve been identified for a deployment to Afghanistan. You need to call me as soon as you get this.” The call that he had received, that motivated him to decide for the both of us that we would take the rescued dog was the Captain calling him to inform him that he was able to remove my husband’s name from the list, and he would not have to deploy. There had been other rumors in the past of other deployments, but this was too close of a call. And with that, Sydney came to live with us; our deployment dog. Ironically, 2 years later, when my husband would actually deploy, Sydney became such a source of comfort and solace for my younger stepson. That dog helped him through the deployment in ways that a human couldn’t. Sydney truly is our deployment dog. When Chris’s unit was identified for the deployment to Kuwait, it was technically a voluntary deployment. However, voluntary, is a very funny word when it comes to the military. First, because of my husband’s rank, there were few alternate options for the deployment. Second, the first sergeant and lieutenant had made it clear to Chris that they wanted him to be one of the two E-6’s to deploy. Third, the intel we had at that time was that the unit would be deploying to Afghanistan in the following spring and that anyone who wasn’t on the Kuwait deployment would be going to Afghanistan. Suddenly, voluntary doesn’t sound so voluntary anymore. Chris and I sat down to make a pros and cons list. We literally thought about the benefits and the consequences of him deploying overseas for 11 months. It’s hard to think of any benefits of being away from your family for 11 months. But we found some. Some of them were financial. Some were personal. But the largest one was that Chris would not have to go to Afghanistan. He had already done 2 tours in Iraq. He had suffered some PTSD after his combat tours. He had known fellow soldiers who died in Afghanistan. So that day, we made a decision for our family that defied logic, and we “chose” the lesser of 2 evils. It’s hard to say if we had chosen differently, whether it would have made a difference. They could have made him go, regardless. It was settled. Chris would deploy to Kuwait in 90 days. I felt like I had been sucker punched. It hurt to hear, how much I’d been hurting him as I pulled away, fighting the reunification of us and our family. But it was what I needed to hear. He was right. We had both made sacrifices over the past year. We made a decision for our future, and now our future seemed threatened. But we could change that. I needed to stop being mad at myself for not having a warm and fuzzy Hollywood reunification. I think that speaks more to the lack of understanding by society and the movies about the reintegration process than myself. We needed to stop trying to figure out who had it worse while he was gone. The reality was that we both had bad days. We needed to accept that this would take time. It’s a process; not an event. We needed to accept that we had both changed a little and that was okay. We needed to figure out how to give each other the space to be the people that we were now, while also coming together in our new life. Marriage takes work. It’s a choice we make for ourselves, every day when we wake up. We needed to choose us. We needed to be a little selfish and focus on us. It was inevitable that some of fears would come true, but it was time to face that. I needed to put my husband, my marriage, and our family first. I needed to focus as much energy into rebuilding as I could. My friendships would suffer. And they did. Some suffered more than others. Some were able to be mended and some may not overcome the deployment. And I need to be okay with that. I need to know that it’s hard for civilians to understand the reintegration process. It’s why my dentist wanted to know why I’d been grinding my teeth. It’s why some of my friends suddenly started being short with me, feeling like I had abandoned them now that my husband was home. They were annoyed with my constant negativity and being stressed out. It’s why it was so hard for me in the weeks following Chris’s homecoming. It was new and very uncomfortable territory. And as soon as I realized that we had faced many challenges in the past, and probably will in the future, but have found a way to come out of them stronger, I was able to let most of the fear and anxiety go. I was able to open up, not only to my husband, but to the prospect that life would change, but I would be okay. Just like when he left and I felt like my whole world was crashing down, I again felt like my world was completely upside down, but I had survived it then and I would survive it now. Chris has been home nine months now. He knows how to work the Keurig and get to the mall. He’s not rendered paralyzed when we go to the grocery store anymore. The kids have adjusted to dad being home, though they are still kids, so they still try to push the boundaries. He and I have learned how to communicate again and how to laugh a lot of things off. I am still working to balance friendship and social activities with marriage and family. We are closing on a house and we just took a vacation to South Africa. We are talking about a family and a future. We are worlds apart from where we were when he got home. We have learned to be patient with each other and the process. We have let go of the anger, bitterness, and fear. We are stronger than ever; Army strong. I’m currently going through all of these same emotions right now. My husband just got home tonight from his 6th deployment, and this one was just different. He was brought home by the Red Cross, because we found out his mom has stage 4 cancer…when ten days ago she just had the flu and felt weak. It was a total shock. Since then, I totalled my car, cried my eyes out locked in the bathroom, and felt super guilty when I thought about how we had just adjusted mid deployment and how our lives were all going to change in so many ways. Of course we were glad to have our husbands safely at home! But I get that twinge of guilt you talked about. I’ve struggled, but I’ve built a tribe of church friends and support and though now I’ll get more help and alone time etc…it’s still hard having that independence kind of taken away and dealing with building that interpersonal connection between him and I. You hit the nail on the head girl. Thank you for sharing. Best wishes, and I hope you’re doing well.